The recent regulatory guidelines provide for the adoption of unified models for the certification of competences (DM 742/2017). How can we ensure that this does not remain an administrative and bureaucratic act, but becomes an incentive for teaching and fits naturally into the planning? 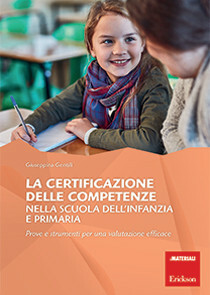 Evaluating and certifying competences presumes the use of tools that are not only able to identify the pupil’s level of learning, but also able to verify the use of knowledge and competences to solve complex and unprecedented problem situations. The ideal framework for this type of assessment is, in turn, a didactics for competences, which enhances the application of knowledge, autonomy, responsibility, initiative and collaboration. The volume is divided into three parts, each one dedicated to a significant passage in the scholastic course of each student, offering working programs, models and assessment tools that allow for the demonstration and strengthening of the level of mastery of competences. In particular, evaluation rubrics are presented complete with indicators that allow the teacher to detect: – the realization and performance of real-life learning tasks – the processes activated – the competences emerged. Skills test 5: Italy tour: an unforgettable trip!